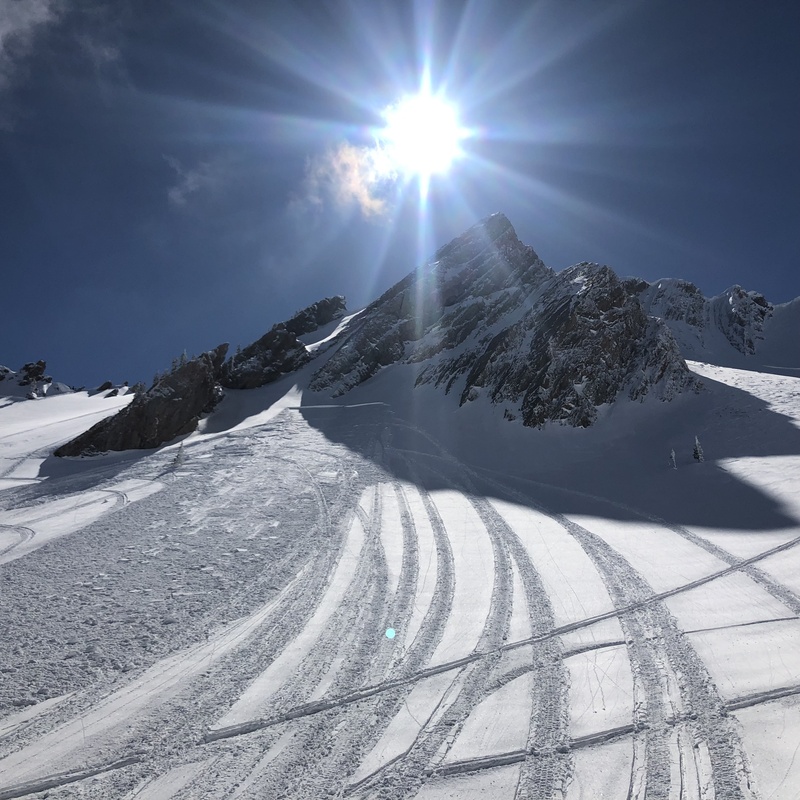 Observed stable conditions, some pinwheeling and roller balls in the late afternoon on steep direct solar aspects, dry shallow pow on direct N. aspects above 8,000', consolidated melt freeze everywhere else. . Seems like a perfect melt-freeze cycle. 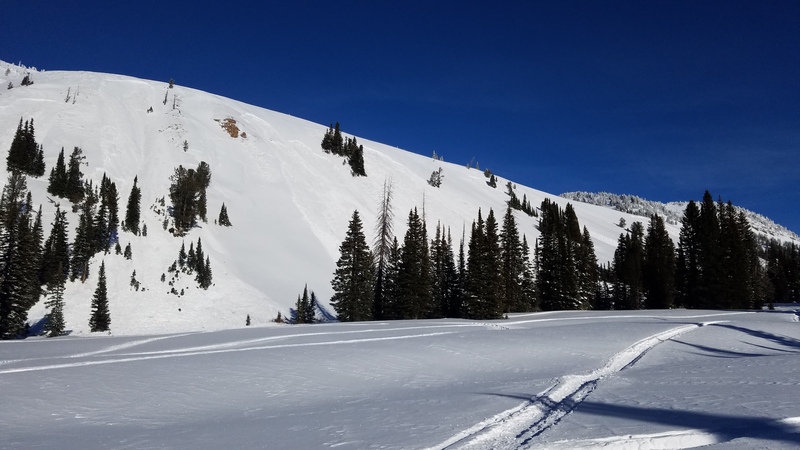 Saw lots of highmarking on W. face of Jefferson, Reas Peak, and the Divide w/out slide activity or any movement in general on all but South Facing slopes, which were out of view. 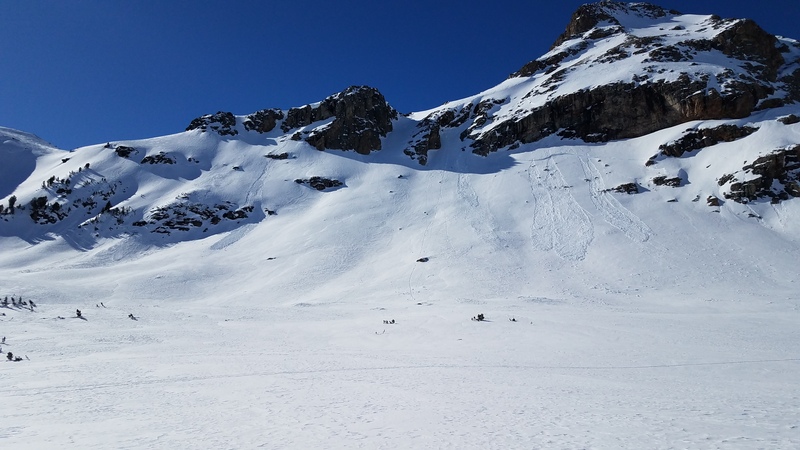 We found a 2.85m settled base at roughly 7,000’ elevation base camp of Hellroaring Powder Guides. The temps have been cold, but warming into the high 20s, low 30s during sunny periods. A sample snowpit showed a weak layer of concer at about 50-60cm below the surface, made of very small facets. However, an ECT was non-reactive. 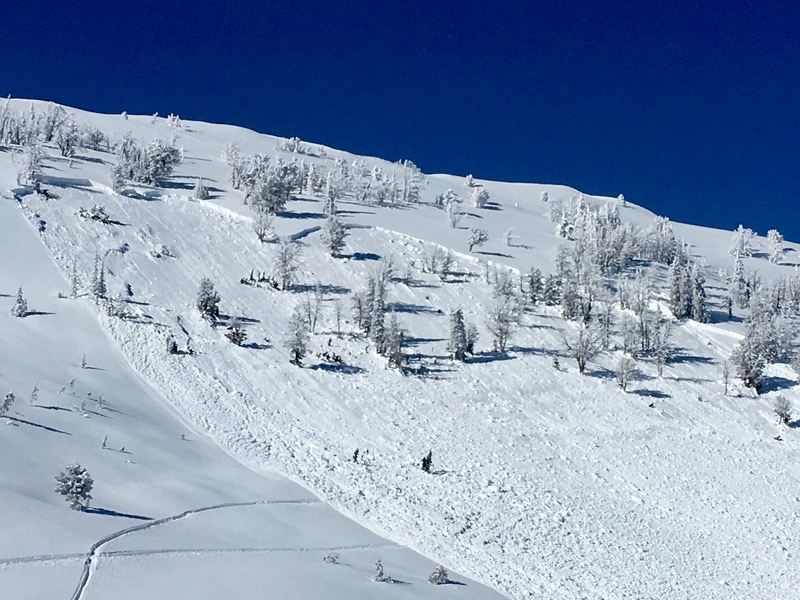 No signs of recent avalanches in the basin were present. 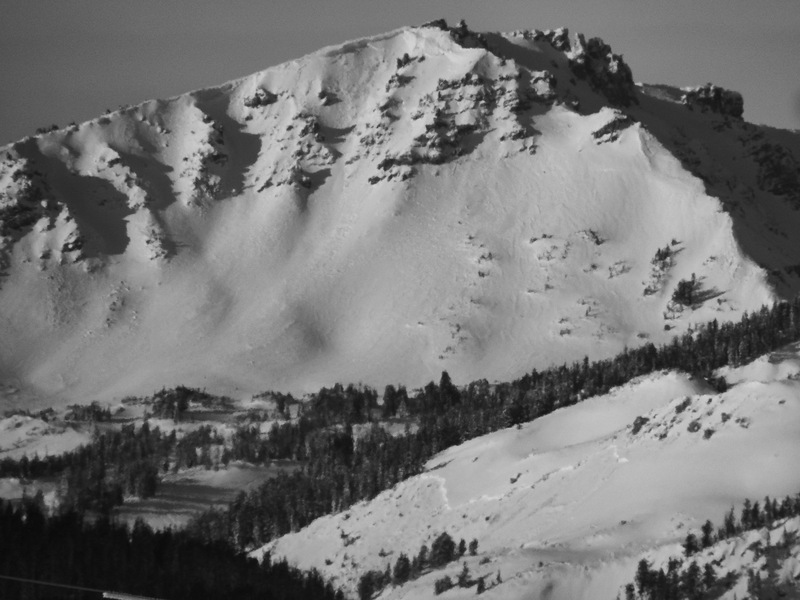 Hower, some debris piles from older slides were apparent in the larger runout zones on Mt. Nemesis. Widespred slide activity from the last storm cycle, e.g. 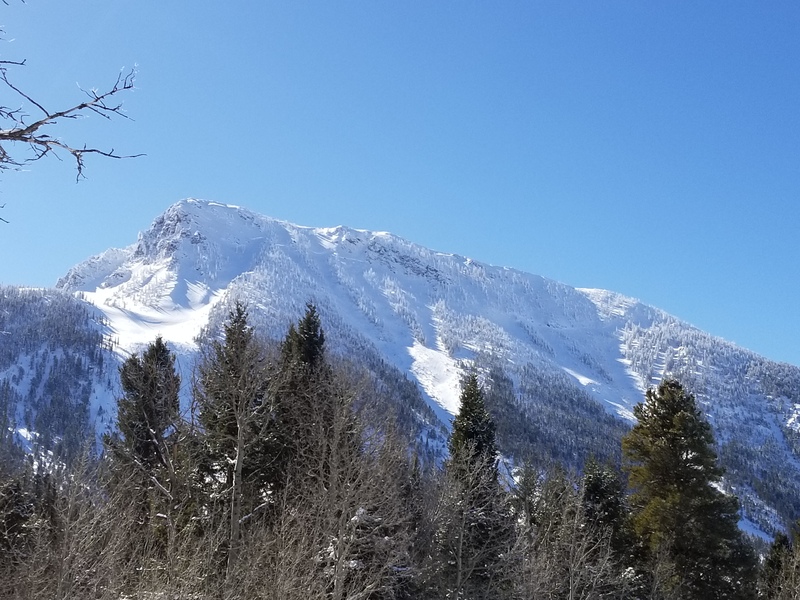 2/14-2/18 ranging from E-NE to W. Aspects all elevations, creek bottoms slid at 7000' and peaks slide at 9800'. DEEP crownlines. From a dist. 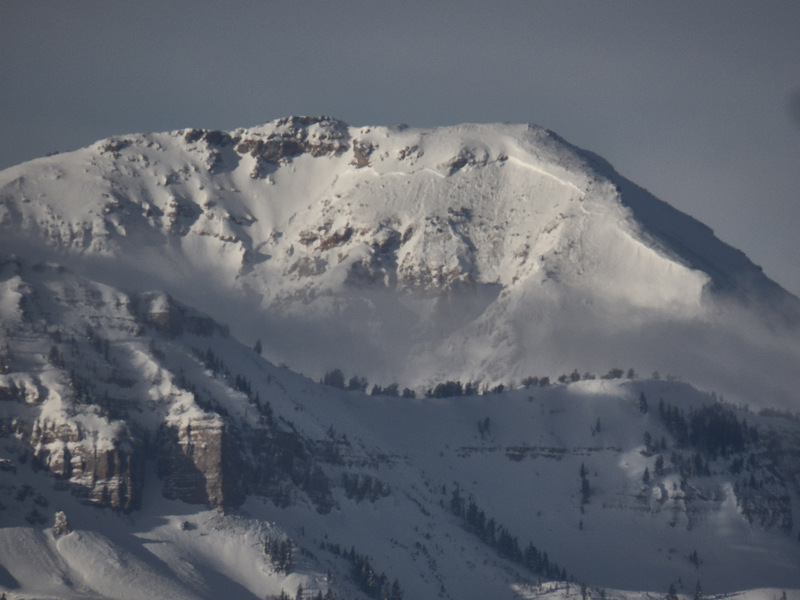 4'-6', mostly in wind loaded terrain, micro-ridges, and corniced areas. 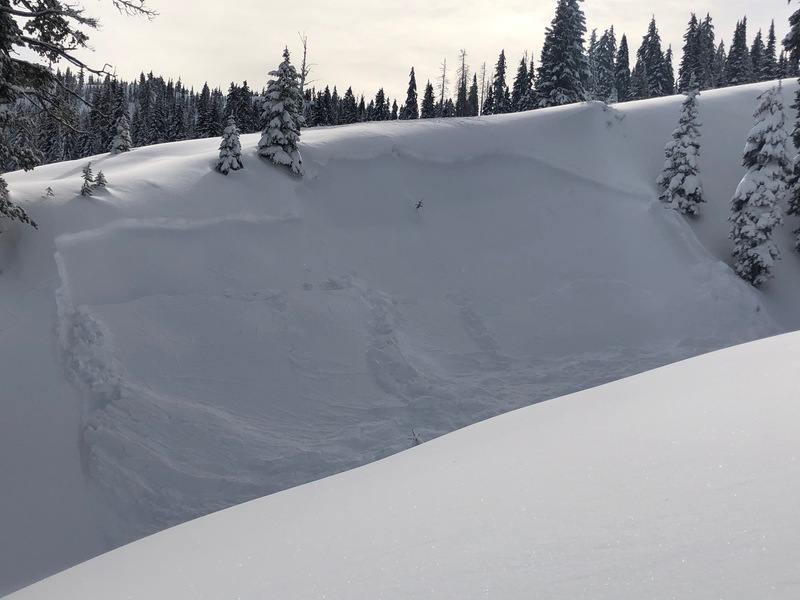 Liz Davey, Island Park District Ranger on the Caribou-Targhee NF, said that the Twin Creek Snowmobile Trail is closed because of avalanche danger!! 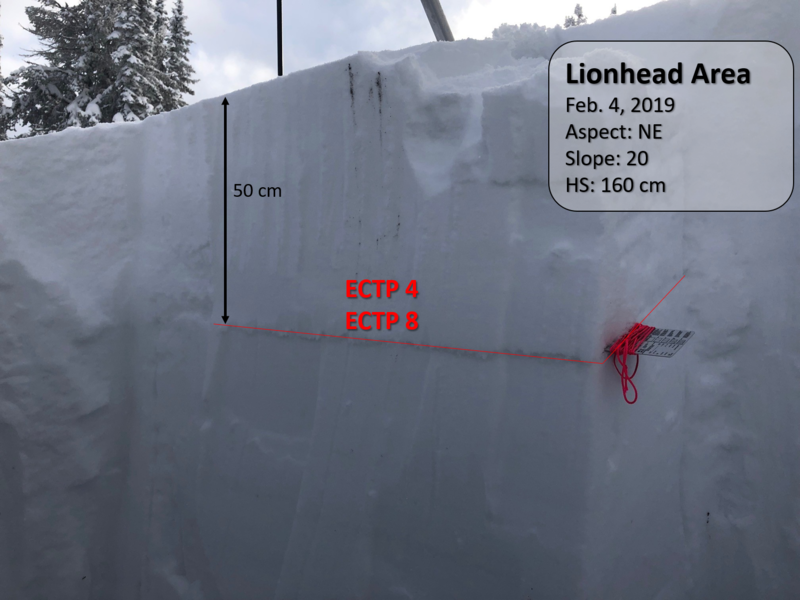 2-13-19 0630Hrs 7700’ at hut, SW winds, mod. 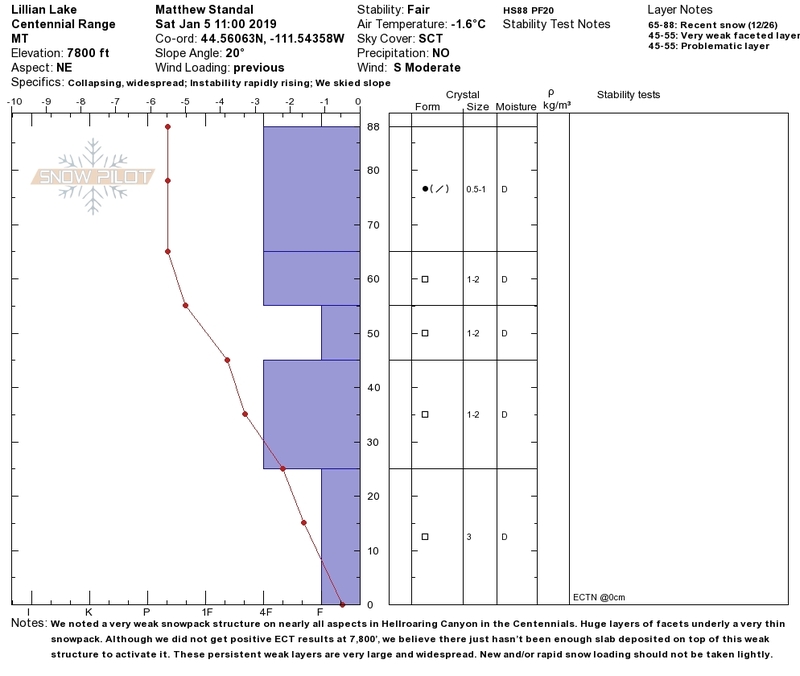 14F, S2 Precip. 1300Hrs Test Pit at top of Pussyfoot, 200 degrees, slope angle 20, 7700 elevation, snowing S2, winds SW and variable and Mod, 14F: 205HS, CT 21 down 61cm; CT 23 down 75; CT 30 down 86. ECTX. We found a dense consolidated layer(k hardness) 12”++ deep, down 120CM and stopped digging there. Storm/wind slab gained energy around 1500Hrs. 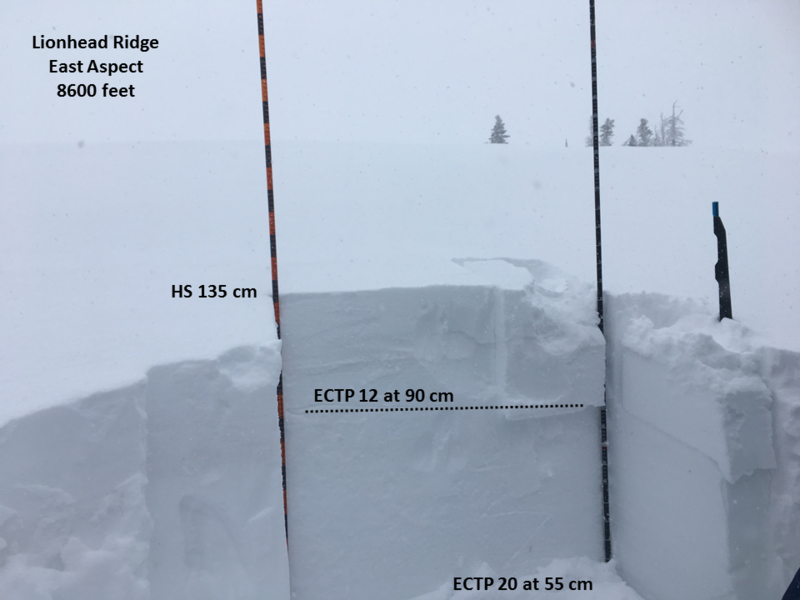 Many different layers in the top 60CM of the new snow, none of them particularly concerning. 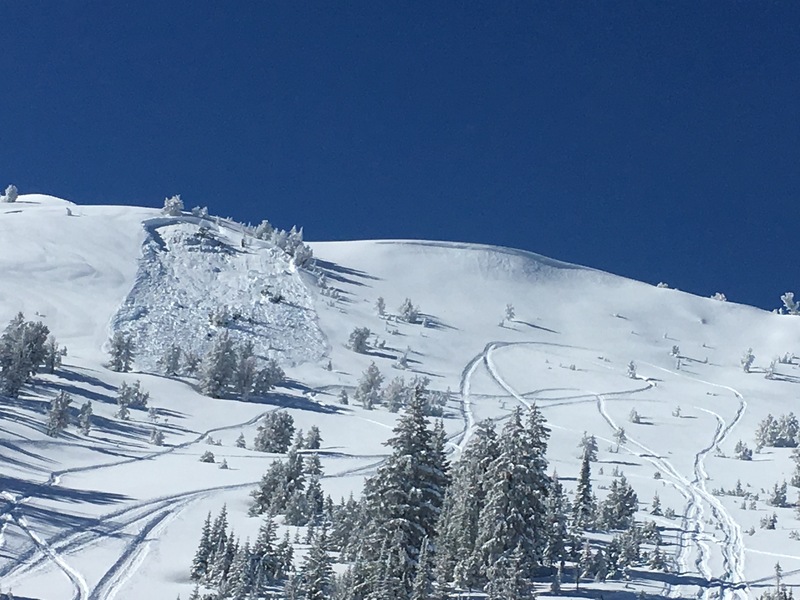 On 2-14-19 0700Hrs At the hut: ,23F, and S2 for 24hrs past, with an estimated 18-24 HN24. SW winds Mod, variable at times. At 0900Hrs 31F, PP/graupel mixed, backing to S1. Barometer rising now. Snow surface had become heavy and dense. Touring out to Pussyfoot, we saw the west facing slope above the Hut around 8700’?? 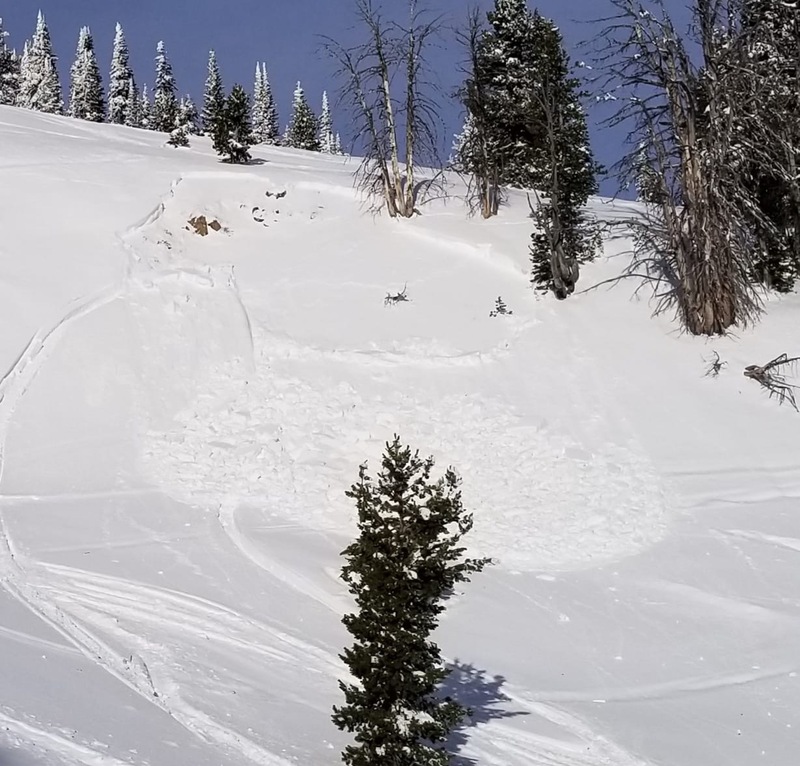 had a new slide with a 2-3 foot crown, possible 200 yards in length running up and over a ridge. Cloudy, foggy no photo taken. 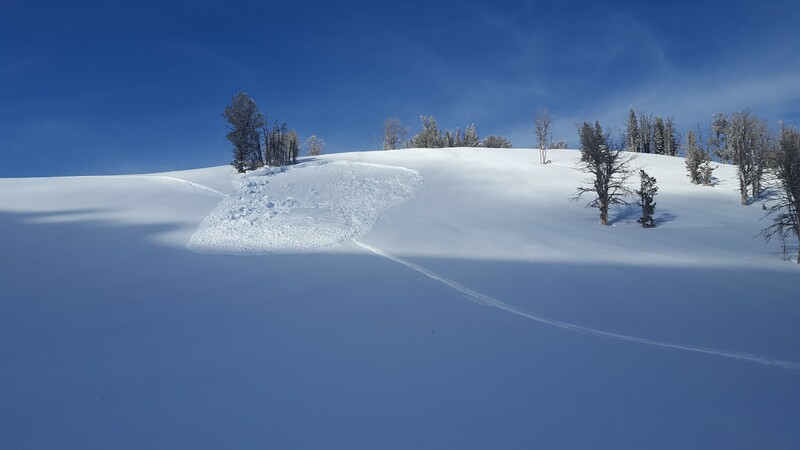 The same area where a “few more turns” happened? 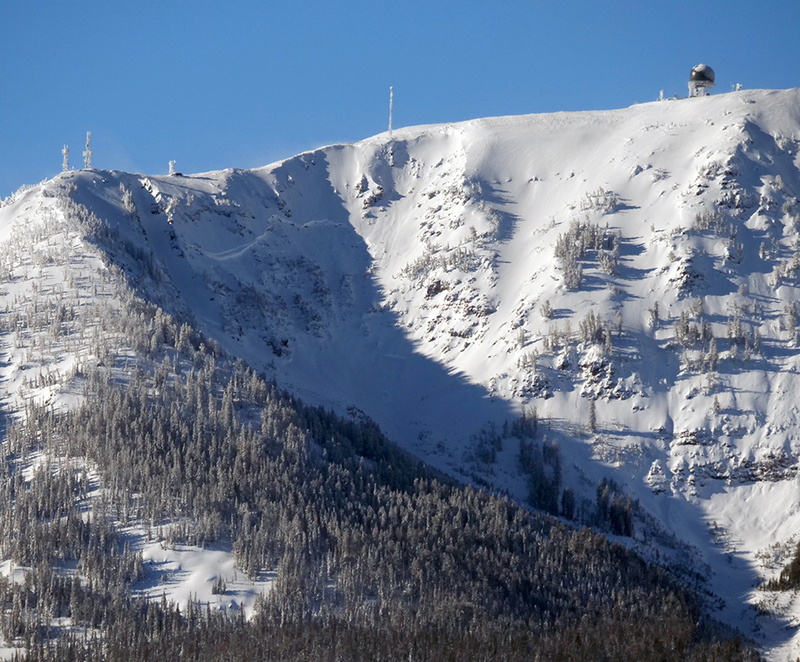 Wind loading and storm slabs present in areas. I saw this with my binoculars from several miles away. 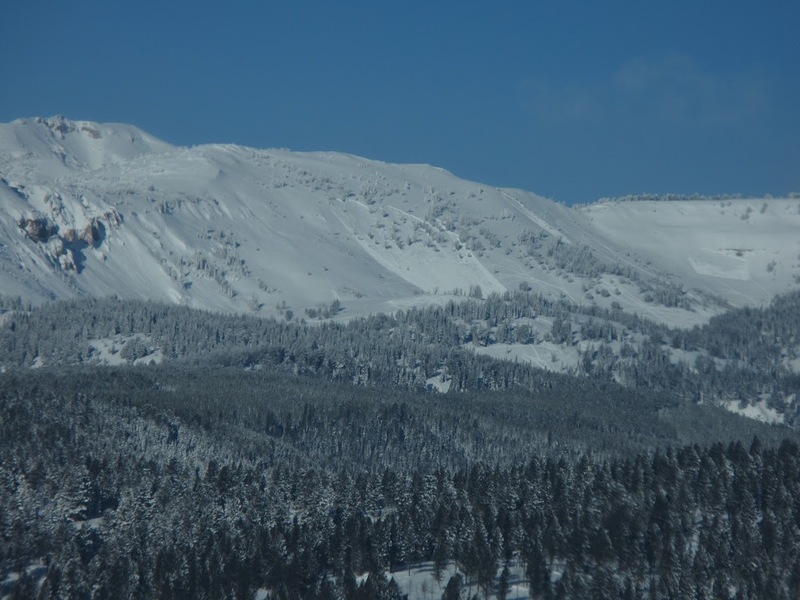 This is just west of Mt Jefferson and on a southeast facing slope. 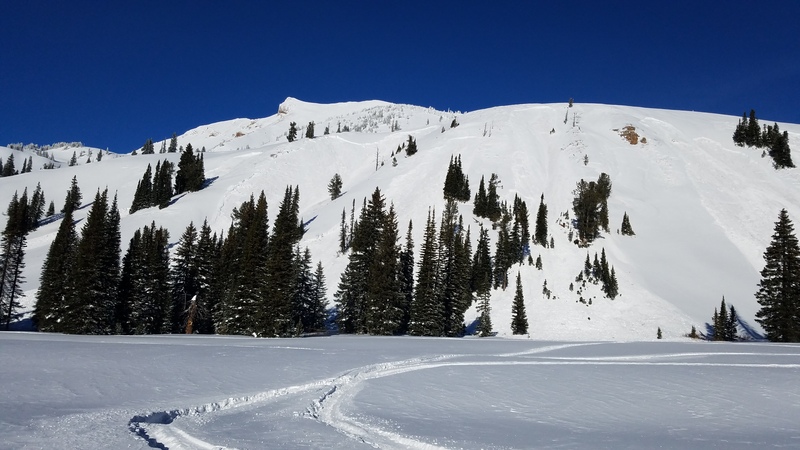 Yesterday, I skied into Hellroaring Canyon with a group of 6 backcountry skiers staying the night at Hellroaring Hut. 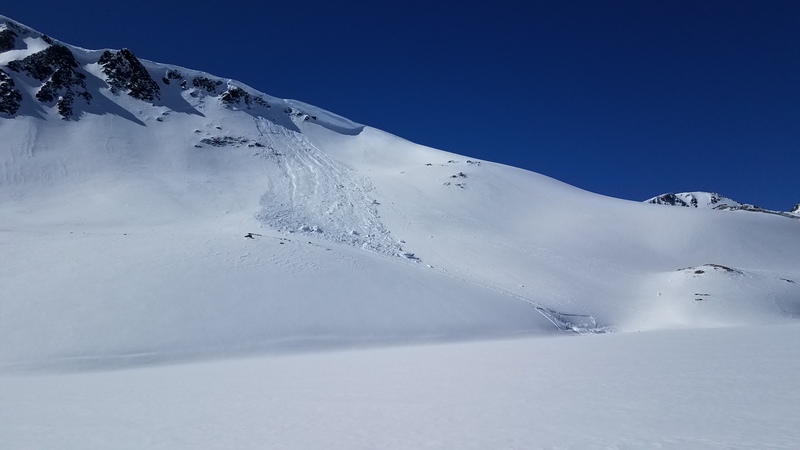 While guiding the skiers to the hut, we saw large deposits of avalanche debris in the bottom of major slide paths on west and southwest facing aspects of Mt. Nemesis. 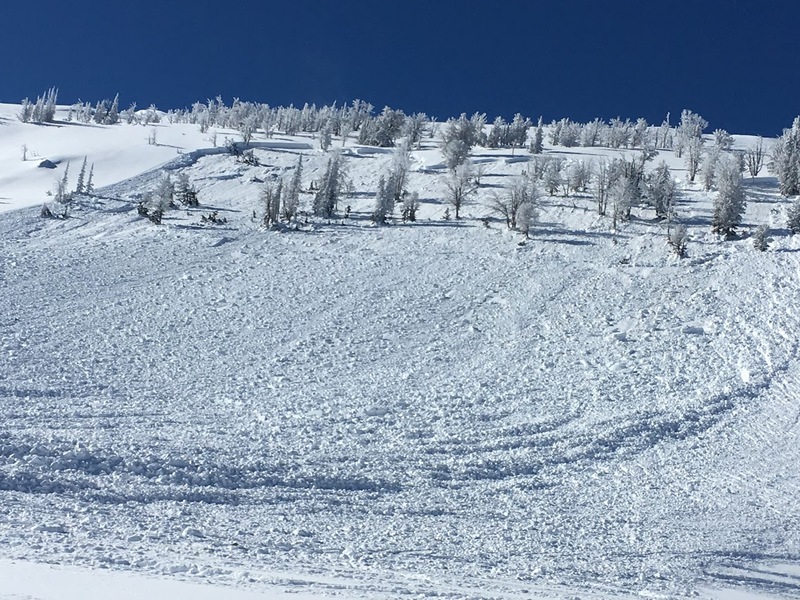 It appeared that some of these avalanches were roughly size 1 - 2.5. 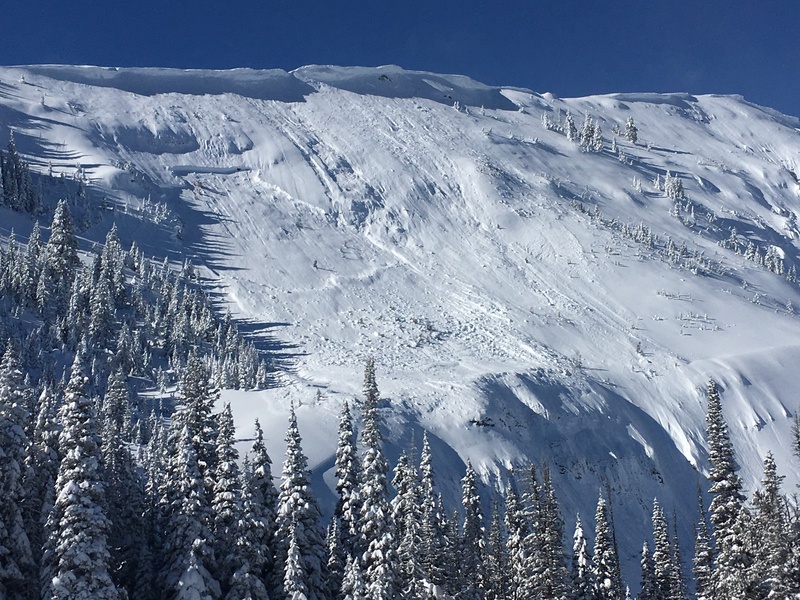 Numerous creek bottoms and cut banks had also avalanched into Hellroaring Creek. 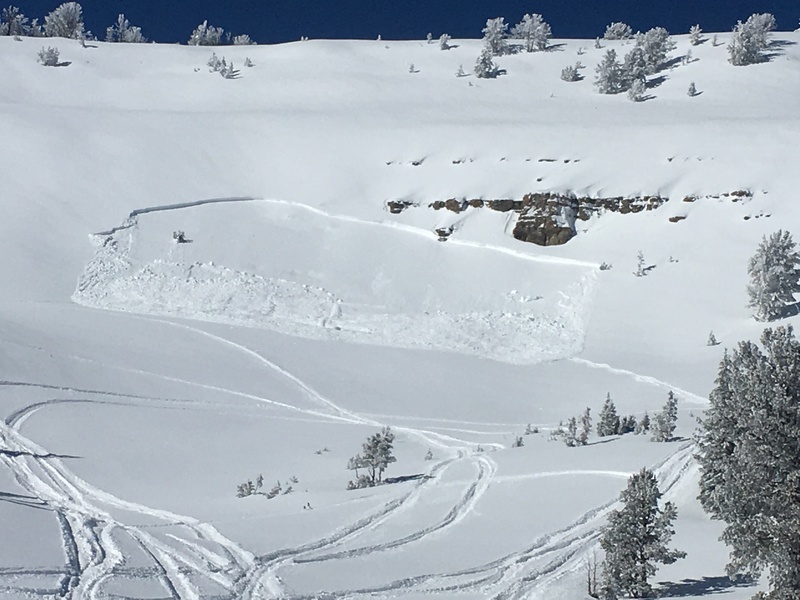 Even some very low angle NW facing gully features had been ripped out. Looking across the valley into the Blair Lake area, I noted only one very small slide on a steep, rocky aspect. 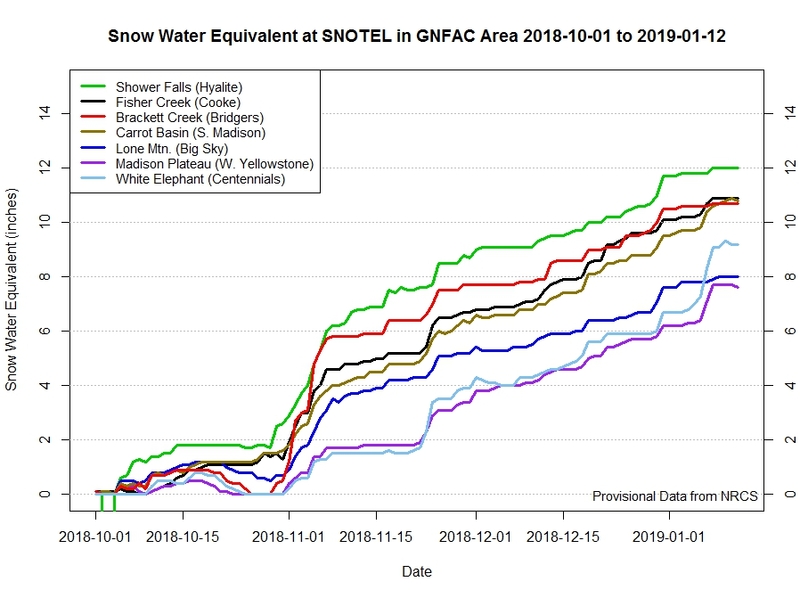 I did not have a chance to dig a snow pit, but I did observe numerous huge “whoompfs” while ski touring, and it was obvious that the faceted layer underneath last week’s 6 inches of new snow was failing regularly. We rode this area all day. 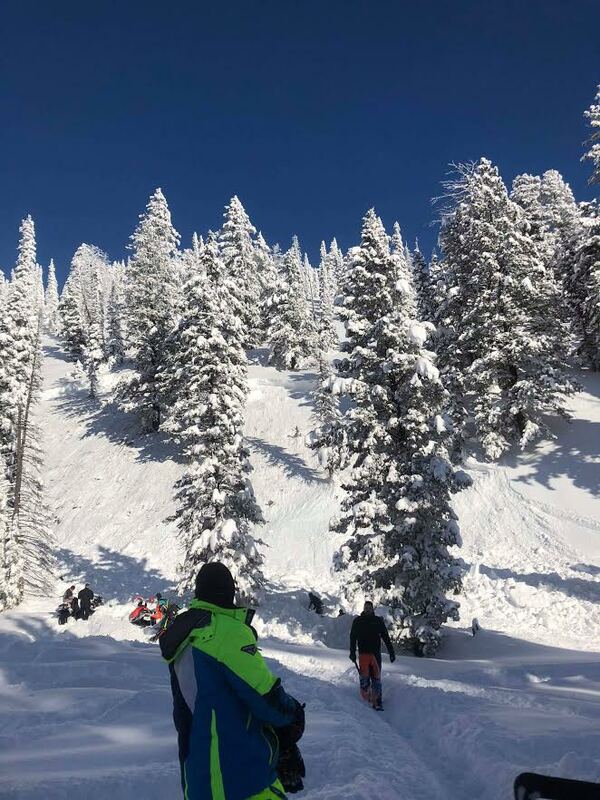 No one in the group had ever ridden this area, so it was an exploitation day. 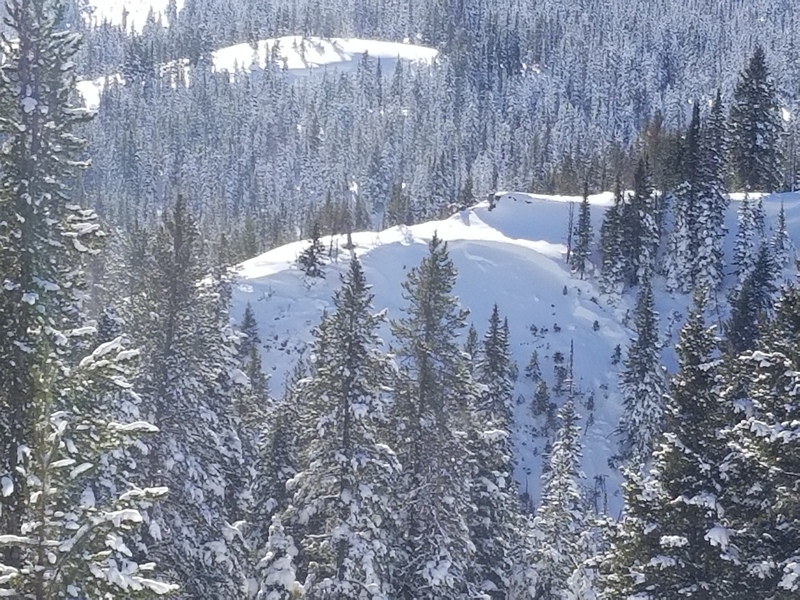 I dug a pit on a S facing 10* slope at 8564’. HS 144 with 6 distinct layers, everything above 60cm was fairly consistent, the bottom 60 was JUNK, all large grain facets that were very soft, with little to no cohesion. I was surprised by the failure I got at 132cm, it failed very easily on the shovel shear, and with a CT11. I got an ECTN17 also at 132cm, nothing else. I did a PST just for the sake of killing time at had a 15/end at the 60cm interface. If there is a large enough trigger I have no doubt that the current slab is capable of propagating, and if it does the slide will likely be big. 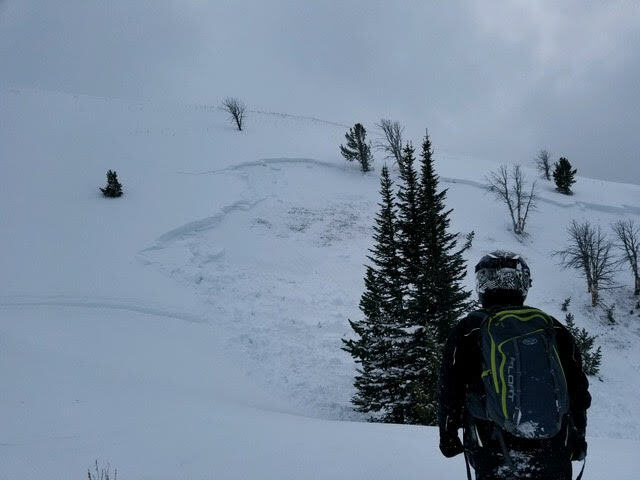 We did not see any avalanche activity while riding or driving in. 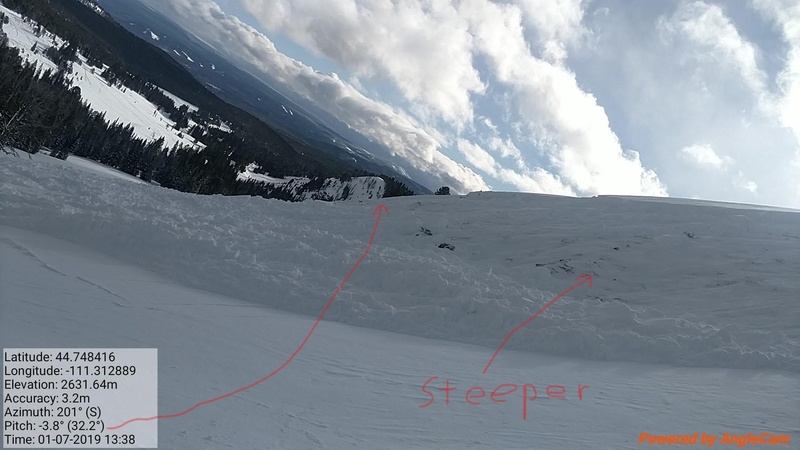 Remote triggered several slides from bottom of slope on south facing slope. 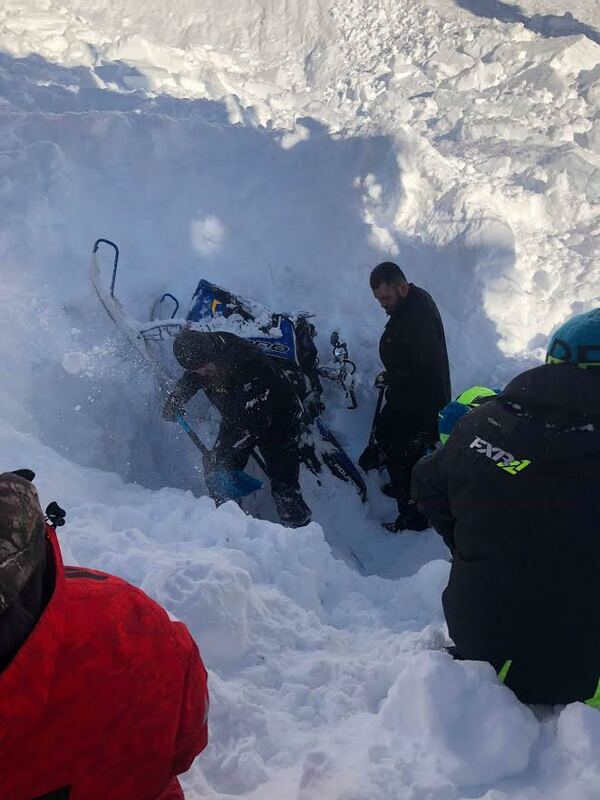 Avalanche triggered remotely by a snowmobiler near Lionhead Ridge on January 7, 2019. 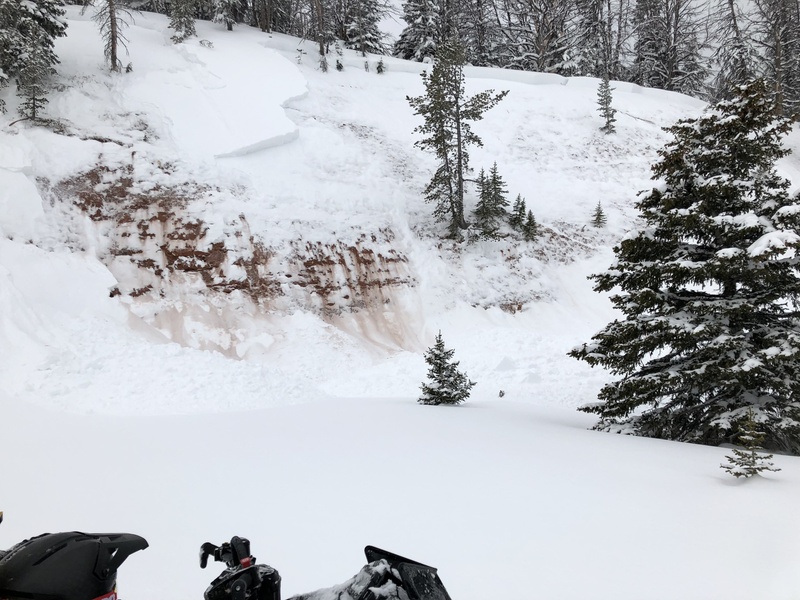 From email "24 inch crown and about 200 feet wide... on an easterly wind loaded slope"
From e-mail: "This was a snowmobile triggered slide in a S aspect in the Blue Creek Drainage SE of Reas Peak in the Centennials. No one was caught and no injuries as far as I can tell".